Be Bold Be Brave Be Free Ten years after the great war of 2185 the queen’s reign is threatened by uprisings and fear. In celebration of my sixteenth birthday it is my duty as princess to sacrifice a slave to be initiated into the ruling council, solidifying my mother’s empire. When my own erratic powers surface I’m captured and tried for treason. Slaves hate me, my mother wants me executed, and my only chance of survival rests in the hands of a young man, Ryder Arteres, whose sister I sentenced to death. Today I have reviews for all three books in this series to share with you, which I'm very excited about. I must say how fast I read this book, one day! Honestly, this is a huge page turner that doesn't stop till the last three words on the very last page that says To Be Continued. Fair warning when you start this book from the very first sentence to the very last you will be stuck and the book wont leave your hands. At least that's what happened to me. I think the best part about this book was that you never knew what was going to happen next and I was on the edge of my seat the whole time. As for the characters, this fabulous author has a way of wording and showing you who each of them are as a person. Some you will root for and some you will hate. But the way she writes is just fantastic. Also, I never thought that certain characters would end up together and no I'm not going to give away who, because I try my best to keep reviews spoiler free, but OH MY GOD! With all the action, love and well more action, I wasn't sure which way was up at times and I mean that in the best way possible. Every time I tried to predict what was going to happen to these fantastic characters I would turn the page and take a deep breath before I read further, just to find out how wrong I was. I can't wait to read more from this fantastically amazing author. I do hope in the next books that there is a bit more history though, that is the only thing I think I was waiting for and didn't happen. I need to know more of the past for each character. 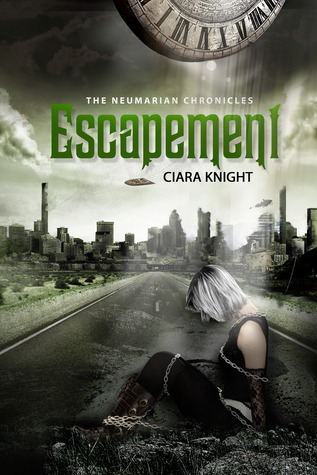 Author Ciara Knight's world building skills are superb as well! Oh and I must say, holy crap this cover. I think it is one of my favorite Dystopian covers ever. This is a series that I highly recommend to everyone that I know and right after I finished the book I did just that. Here at Ali's Bookshelf we accept books in exchange for a honest review. However, the book above was one that I bought and decided to review. It is part of a blog tour, through Xpresso Tours, that I signed up for so I was happy that I already had the first one on my shelf. We also use Amazon Affiliate links at times.